During the Barack Obama presidency, Meese was a frequent critic of the administration. Only a few months into Obama’s second year in the White House, Meese spearheaded an advocacy campaign aimed at warning the country that the existence of the United States was in jeopardy because of a dizzying array of purported threats, including unsecure borders, Shariah law, and unlawful combatants. To publicize these threats, Meese and seven coauthors published an op-ed in the right-wing Washington Times that called for a “renewed adherence to the national security philosophy of President Ronald Reagan: ‘Peace Through Strength.’” Meese’s coauthors were Frank Gaffney (Center for Security Policy), Clifford May (Foundation for the Defense of Democracies), Elaine Donnelly (Center for Military Readiness), Brian Kennedy (Claremont Institute), Herbert London (Hudson Foundation), and Herman Pirchner (American Foreign Policy Council). To address these “risks,” campaign supporters reiterated the 10-point platform initially laid out by Meese and his coauthors in the Washington Times: 1) Renewed adherence to the national security philosophy of President Ronald Reagan: “Peace Through Strength”; 2) A robust defense posture including a safe, reliable effective nuclear deterrent; 3) Preservation of U.S. sovereignty against international treaties; 4) A nation free of Shariah law; 5) Protection from unlawful enemy combatants; 6) Energy security; 7) Borders secure against penetration by terrorists, narco-traffickers or others seeking to enter the United States illegally; 8) High standards that protect the military culture essential to the All-Volunteer Force; 9) A foreign policy that supports our allies and opposes our adversaries; 10) Judicial and educational institutions that uphold the constitutional responsibility of elected officials to make policy for our military and convey to future generations accurate portrayals of American history, including the necessity of defending freedom. Meese got his start working on the staff of then-Governor Ronald Reagan in California during the 1960s and 1970s. 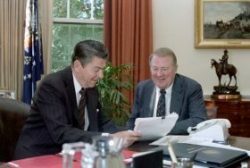 After Reagan was elected president, Meese was tapped to serve initially as the counsellor to the president and on the National Security Council. When Reagan was re-elected, Meese became attorney general. Meese stepped down as attorney general before the end of Reagan’s second term as numerous legal scandals erupted regarding alleged political and financial irregularities. During his tunure as attorney general, Meese was dogged by a number of allegations of bribery and influence peddling. In one case, an independent prosecutor was appointed to investigate alleged financial improprieties by Meese while he was attorney general. As part of the investigation, the prosecutor looked into Meese’s involvement in a Bechtel pipeline deal in Iraq. One of the dealmakers for the pipeline project was Donald Rumsfeld. According to the New York Times, “[Bechtel] has a long history of doing business in Iraq, including an unsuccessful pipeline deal that at one point involved a meeting between Donald H. Rumsfeld, now the secretary of defense, and Saddam Hussein. That project later drew scrutiny from a special prosecutor looking into allegations of impropriety involving Edwin A. Meese III, the former White House counsel and attorney general in the Reagan administration.” Meese’s involvement in the Bechtel deal revolved around his relationship with E. Robert Wallach, a lawyer close to the attorney general who was hired by Bechtel to help negotiate with the Israeli government. Although he was not prosecuted, Meese ultimately resigned. 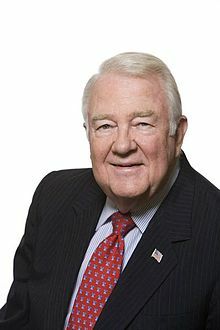 Hoover Institution, “Edwin Meese,” http://www.hoover.org/profiles/edwin-meese-iii. Committee on the Present Danger, https://web.archive.org/web/20071009232538/http://www.committeeonthepresentdanger.org. Meese et al, “Restoring Peace through Strength,” Washington Times, May 11, 2010, http://www.washingtontimes.com/news/2010/may/11/restoring-peace-through-strength/. Bruce Shapiro, “True Believer,” Salon.com, July, 3, 1998, http://www.salon.com/news/1998/07/03news.html.